iPhone OS 4.0 (s aapl) will be arriving for iPhone owners this summer, and for iPad owners in the fall. The question is, what tangible benefits will it bring to your web working routine, if any? Luckily, I’ve had a chance to put the developer beta of the OS through its paces, so I have an early impression of how it might benefit remote workers. I try to keep all my email routed through one central account, but that doesn’t mean I always necessarily succeed. In fact, I have multiple email accounts — which can become quite a hassle to manage, especially from a mobile platform like the iPhone, which doesn’t offer a unified inbox. Or hasn’t, until now. With iPhone OS 4.0, that changes. You get a unified inbox for all of your email — although you can still separate it out into separate mailboxes if you wish, since many people will prefer not to “cross the streams.” And that’s not all. 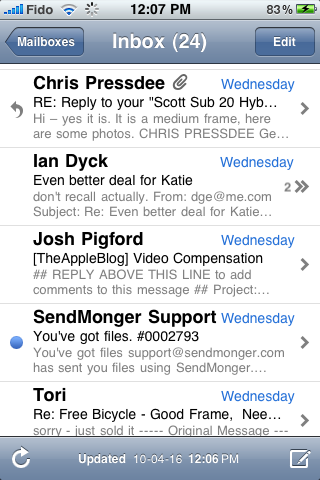 You also get great little improvements to email, like threaded messaging, which allows you see entire email exchanges with a tap instead of having to view them individually. It’s terrific for tracking down phone numbers, meeting times and other information that might otherwise get lost or misplaced in the shuffle. 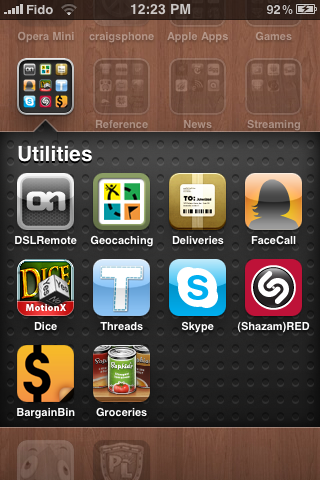 Folders provides you with the ability to group related apps into, well, folders. It’s a feature that makes so much sense, and is so useful and intuitive, that I almost can’t remember what the iPhone OS experience was like without it. First of all, it finally gives me a way to get rid of all those annoying Apple apps that I never use, like Notes, Stocks and Weather. If it ended there, that’d be enough. But it doesn’t end there. Folders means that instead of countless home screens, I have just two, and any app I could ever desire to access is only a tap away — a single tap, vs. however many it would take to find it on a home screen, or using Spotlight. 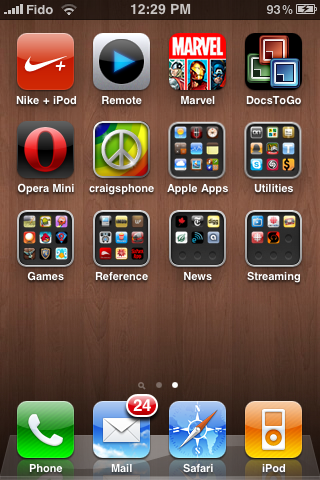 Best of all, you can categorize apps by common function, which for business purposes is very useful indeed. While only native Apple apps like Settings so far have access to this API, I can already tell it’s going to revolutionize the way I use my phone for work. Being able to pop in and out of a document I’m working on in Documents to Go just by double-clicking the home button will save time and headaches. And being able to run processes like compressing video or uploading a document without having to keep an app open translates to increased productivity on the go. I’m sure my predictions for how multitasking will affect productivity software don’t even begin to cover how developers will put the new feature to use. I can’t wait to see what they have in store for us! I’ve been pining for this feature for a long time, and it’s finally here. It was mentioned only briefly during the iPhone OS 4.0 event, but it’s huge news for web working, especially if you spend a lot of time traveling and aren’t interested in picking up an iPad. In iPhone OS 4.0, pairing your iPhone with a Bluetooth keyboard is ridiculously simple. I set mine up with my Apple Wireless Keyboard, so I’m not sure how well it works with other brands, but all I had to do was disconnect the keyboard from my Mac mini and pair it to the phone by entering a code on the keyboard. It’s now paired with both, and can easily switch between them. Typing on the keyboard is a game changer for the iPhone. With some kind of stand for keeping the iPhone propped up, it becomes a perfectly usable laptop replacement, weighs much less and takes up much less space in your bag. I plan on using it for short trips in combination with Documents to Go, leaving the MacBook at home. So many of the changes in OS 4.0 seemed geared towards business use, that it almost seems like that was the primary purpose of the update. If you’re a remote worker, and you have an iPhone, this update will change the way you do your job. 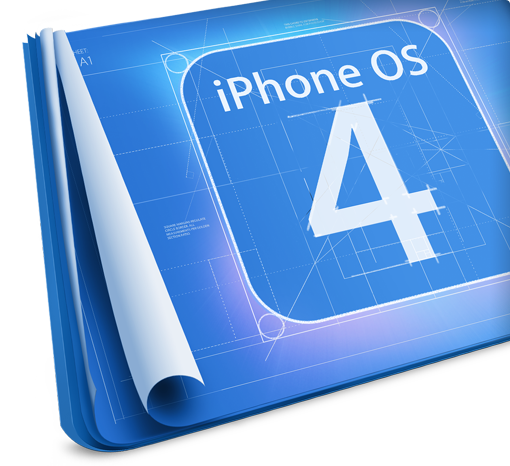 What changes in iPhone OS 4.0 are you looking forward to the most? What about the iPhone for the T-mobile network? What is the situation, is it coming out 7/30/10 and does it have the same fitures as the AT&T one does? I wish someone would be able to link my Texts with my emails so that they all come under one name or nickname. This might be a dumb question, but can you load the developer preview of 4.0 on the iPad now, or is that coming in a future release? These features are general user niceties and nothing about them stands out as particular to business. One might make a better case for 3.0 with its Exchange support. I can’t wait to get my hands on this. But, why Fall on the iPad Apple, why?? These are all common sense updates which are much needed. I particularly like the changes to email to help it manage better and the use of folders which I have been wanting for a long time, now it will be much easier to keep the screen neat and tidy and not have a cluster of apps on the screen and having to navigate through it all. What are these “folders” you speak of? Can you explain them better such that I can understand. Go to the Apple website, there is a video showing the new features.